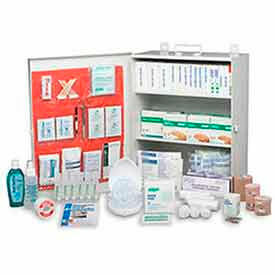 First Aid Kits Provide Quick And Handy Solutions For Minor Accidents And Medical Emergencies. 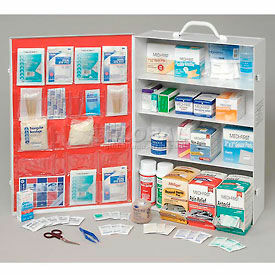 First Aid Kits are made with metal, steel, plastic or nylon cases for compact portability and long lasting durability. Kit includes Features bandages, wipes and other components to meet the requirements of a variety of emergency situations. Available kit styles include Contractors, First Aid Cabinet, First Aid Kit, Specialty First Aid Kit, Travel First Aid Kit, and Vehicle Kit. Kits available to treat 1 to 200 people. Dimensions and case materials vary per model. Pursuant to section 9; for workplaces with 6-15 workers. Regulation first aid kits meet regulations required by each jurisdiction; regulations change on a continuing basis. St John Ambulance Packet Guide (English/French) Is Used For Applications Including Medical, Athletic, Emergency Services And More. Guide provides procedural information for rescue hazards, breathing emergencies, unconsciousness, fractures, poisoning, burns and more. Bilingual format includes English and French. 68 pages. 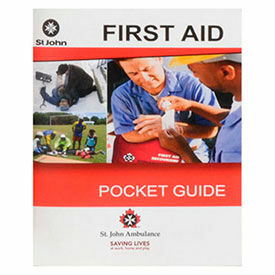 Type is St John Ambulance Packet Guide. Package quantity is 1. Dimensions are 3.27"L x 4.02"H.